How Will Wells Fargo Be Affected If The Fed’s Growth Restrictions Remain In Place Over All Of 2019? Loans across the U.S. banking industry continued their growth trajectory over the third quarter of the year, albeit at a slower rate compared to the previous quarter. The total portfolio of loans across U.S. banks witnessed year-on-year growth of 4.6% in Q3 2018 – down from 4.9% in Q2 2018 – as there was a visible reduction in the rate at which the banks handed out loans across categories. The only loan category to grow faster in Q3 compared to Q2 was commercial and industrial loans (5.4% growth y-o-y in Q3 compared to 4.8% in Q2) – something that can be attributed to the fact that many banks relaxed lending requirements for businesses in the second quarter. Notably, this helped commercial and industrial loans become the largest loan category for U.S. banks. That said, the fastest-growing loan category remains credit cards, as upbeat consumer sentiment over recent quarters has boosted discretionary spending among individuals. Credit card loans across U.S. banks swelled 9% between Q3 2017 and Q3 2018. In fact, continued strength in card lending helped the total card loan portfolio in the U.S. banking industry cross $800 billion for the first time in October, although some major card lenders have begun tightening card lending to keep potential loan losses in check. 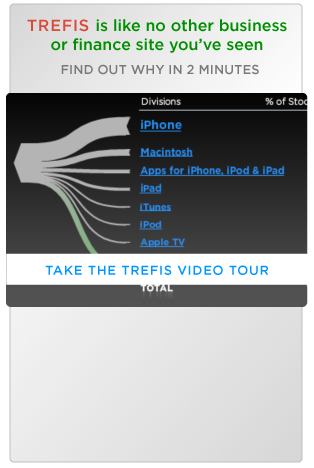 We capture the trends in loans and deposits for each of the five largest commercial banks in the country – JPMorgan Chase, Bank of America, Wells Fargo, Citigroup, U.S. Bancorp – through interactive dashboards, while also detailing the impact of changes in these key factors on their share price. The table below is based on the Federal Reserve’s most recent data. * Credit card loans include unsecured revolving credit, while retail loans include auto loans, student loans and other secured consumer loans. Other loans primarily include loans to financial institutions, to foreign governments, and for agricultural purposes. As shown above, mortgages, commercial loans and CRE loans now represent roughly equal parts of the total portfolio of loans across U.S. banks (~24%). Notably, mortgages made up more than 30% of these loans in 2011, but a slowdown in the mortgage industry and strong growth in commercial lending over 2012-2014 has resulted in all these loan categories being nearly identical in size now – with commercial loans now being the single biggest loan category. 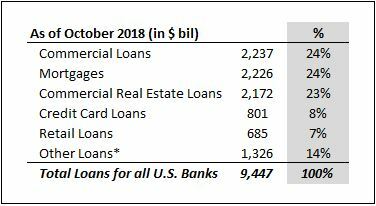 Also, as detailed in the table below, the U.S. banking industry saw total loans grow by 4.6% between Q3 2017 and Q3 2018, with card loans growing the most (9%) and mortgages faring the worst with a growth rate of just 1.8%. We expect this trend to largely continue over the next several quarters as the Fed’s rate hike process weighs on loan growth – especially for mortgages. Mortgage lending is likely to pick up the pace only once interest rates settle down, which we believe will be around mid-2020. In subsequent articles, we will highlight the changes in the loan portfolio of the five largest U.S. banks over recent quarters, while also detailing the relative importance of individual loan categories to the business model of these banks.